A few charts have circulated in the blogosphere recently noting the positive impact on an investor's total return if they simply miss a few of the worst down market days. I have not come across a definitive set of parameters that ensures the positive success of this type of strategy; however, the benefits appear quite substantial. On the other hand, as attractive as 'cashing out' of the market may seem, getting back in can be even more difficult. The below chart shows the price return of the S&P 500 Index (blue line) plotted against the return if an investor simply avoided the five worst market days each year (green line) and the return if an investor avoided the five best market days each year (red line) going back to 1980. 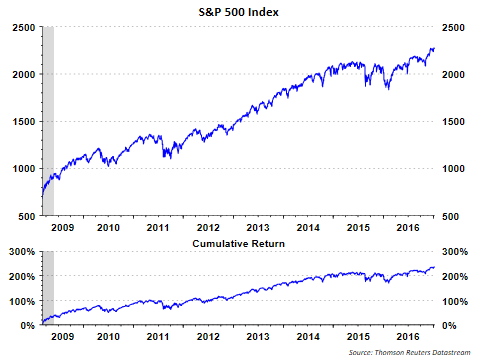 As the chart clearly shows via the red line, positive equity market returns in any given year are generated on just a handful of days. 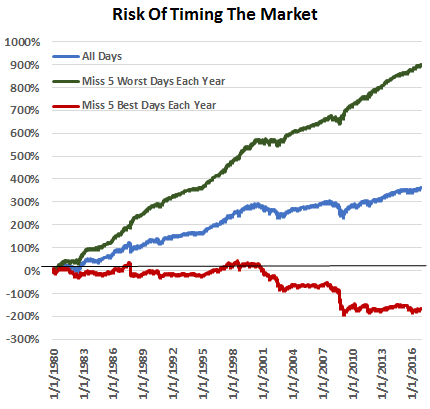 Missing those few up days each year almost certainly guarantees an investor will lose money, or substantially underperform, over the long run if they attempt to time in and out of the market. So what should an investor do? Fidelity recently prepared a report, Six Habits of Successful Investors, that contains useful strategies for investors that will increase the probability of growing ones wealth. In an effort to summarize some of the article, a key is having a long term plan that works in both up and down markets and one that an investor can follow during market swings. Having the discipline to follow the plan can mean increasing ones investments during down markets. And importantly, diversification is beneficial as some asset classes will hold up better when other asset classes experience downside volatility. For example, as difficult as it may seem to own bonds as rates are rising, the right allocation can serve as a shock absorber when equities decline. The entire Fidelity article is a worthwhile reading. At the end of the day though, timing in and out of stocks is almost assuredly a loser's game.